Nature printing with plants has European roots and was often used to identify plants before offset printing and photography were available. Christy Dewees has always loved plants. She has a degree in Botanical illustration and a certificate in Graphic Design. As an enthusiastic naturalist, Christy has often shared her passion for plants with people visiting the UC Davis Arboretum. She was drawn into nature printing when she accompanied her husband, Chris, to one of the early Nature Printing Society annual meetings, on Catalina Island, in 1989. She was so inquisitive and engaged that the workshop coordinator declared, “Christy, you’re just going to have to become a member!” At each annual workshop since then, she tries new techniques, taught by other members, but before exploring alternatives, one should learn the basics. 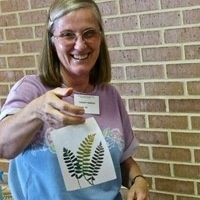 With basics in mind, participants will learn plant printing techniques on paper and then on fabric as well as information about local plants. All the printing materials will be supplied. You are encouraged to bring any leaves (preferably relatively flat and textured or prominently veined, not slick) as well as any fabric items (shirts, canvas bags, dish towels, etc) you may want to print on. At the end of the day, you will have many plant prints to take home. Visit deweesnaturedesigns.com for more information about Christy’s plant printing and illustration.